Jomolhari or Chomolhari is also known as “the bride of Kanchenjunga”. This majestic mountain peak straddles between Yadong County of Tibet and Thimphu district of Bhutan. The mountain is the source of Paro Chu (Paro River), which flows from the South side. Jomolhari is also one of the holiest mountains in Bhutan and it is believed that it is the abode of one of the Five Tsheringma Sisters – female protector goddesses (Jomo) of Tibet and Bhutan. The trek is a beautiful mix of breathtaking views, high altitude trekking, religion and vibrant Bhutanese culture. We have added extra days for you to visit and spend time in the two bustling yet unique cities of Bhutan – Paro and Thimphu. There are multiple itineraries through which you could see the majestic Jomolhari. We have two itineraries for you. The first one is the classical Jomolhari Trek with additional days to explore Bhutan. The second one is shorter treks with different route yet as scenic and beautiful. The number of days for both the itineraries could be customised based on request. The Jomolhari Dodena trek is one of the most popular treks in Bhutan. It starts from the Paro valley and ends in Thimphu. This trek has some of the most amazing views of Mount Jomolhari (7,314 m/23,996 ft), one of the holiest mountains in Bhutan. And you could spend time in Paro and Thimphu as well. Arrive in Paro. Check into the hotel. Sightseeing in Paro. Hike to the Taksang Monastery (Tiger’s Nest). Visit Kichu Temple. Day 3 / Drugyel Dzong (2,580 m/8,465 ft) to Shana (2,890 m/9,482 ft): 15 km/2 hour drive. Trek to Soi Thangthanka. The ruins of Drugyel Dzong lies on the road North from Paro. At the end of the road north from Paro lie the ruins of drugyel dzong with Mount Jumolhari (7315m) behind. As we start our first day’s walk we will pass Tshento (chang zampa) where there is a small settlement which includes a Basic Health Unit (BHU) for people living far from any hospital. 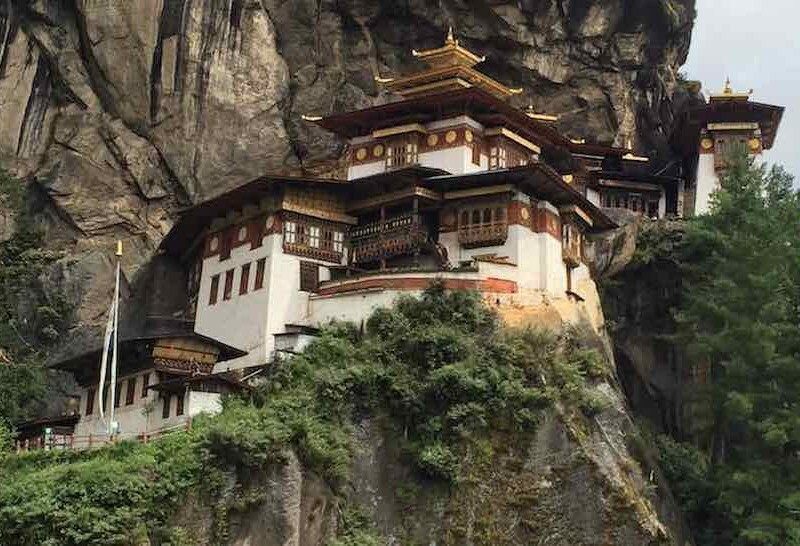 High up on the cliffs is a hermit building known as Chona Gompa (11,430ft/3485m). As we cross the swiss-built suspension bridge at 2485m on the way to a chorten, we will stop for lunch. Holy water from the Hedi Monastery runs on one side of the chorten. After crossing another bridge next to the Paro Chhu River, we will finally see the famous Hedi Gompa, located 200m higher and known for its large ancient statues. Soon we will reach Chobiso (2780m), where it is said that anyone gains merit by walking through the prayer wheel Chorten there. After two more hours walking your trekking permit will be checked at the military camp entrance. After another 20 minutes walking on the river side and some forest we will finally reach the big open field of Shana (2890m) where we will set camp for the night. A big snowy peak can be seen from the camp: Chatarake (Djo Drake, Jo Darkey: 6500m), which was first climbed by two dutch climbers. Note: As we have road connectivity now, so you can drive to Shana early in the morning with is 2 hours drive and than start the trekking. Day 4 / Shana (2,890m/9,482 ft) to Soi Thangthanka (3,575m/11,729 ft): 22 km/6-7 hours. Following the river up stream for a short 10 minutes, we will reach an old ruined bridge (Penji Zampa or Shana Zampa, 2878m) caused by the major floods of 1950 and 1960. 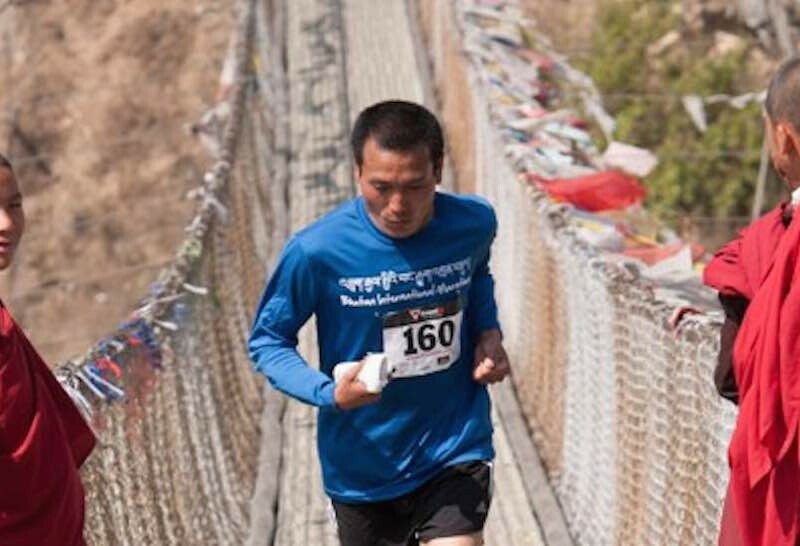 This bridge was the first en route from Tibet to Bhutan mainly used by traders. On the other side of the river is Jigme Dorji National Park where different species of trees and birds are found. After trekking for 2 hrs we will reach Shing Karap (3100m) and a little further a big bridge at 3250m taking us to the east side of the river. Another five minutes and we will reach a big clearing in the forest, Thongo Samba, where our lunch will be arranged. The trek to Soi Thangthanka continues for 3-4 hrs. After some hours a bridge is crossed where you may encounter yaks. From the second bridge leading to a chorten, you might see Jomolhari to the north. The Soi Yakse valley opens up to the west with several snowy peaks between 5000m and 5650m at its end. Soi Thangthanka or Tshajeu Din Kha camp is on a big meadow. As we enter the Soe Valley (Soe Yutey) we will be crossing the border between the Paro and Thimphu Dzongkhag (Districts). The trail will follow the river and change several directions until it reaches a military camp where trail leads to another pass into Tibet, 11km away from Phari. About an hour beyond the military camp we will reach an open meadow at an altitude close to 4000m ideal for lunch. Continuing today’s walk we will see a few small villages ahead. The Soe Yutey valley has six villages: Jomphu, Dozuden, Tikithang, Dotabithang, Dangojang and Jangothang. The population of that area is approximately 220. The first village, Jomphu, is above the actual trail. In Dangothang, two new buildings have been erected for the Jigmi Dorji National Park next to the BHU building. By now there should be a view of the spiky peak Jitchu Drake (6850m). After crossing the ruins of a dzong, decorated prayer flags and a bridge, appears the east face of Jomolhari (7315m) with its massive 3200m-high wall of granite, marble and quartzite. We have reached Jogothang, the base camp of Jomolhari. Day 6 / Rest day at Jomolhari camp. An easy day hike up the valley towards the foot of Jomolhari. The moraine-ridge walk gives a good view down to the glacier. Ahead, the east face of Jomolhari gets closer and closer. Two hours from the camp are two twin lakes Tsho Phu at 4,350m. The most challenging day hike, 3-4hrs, to reach the final rocky summit at 4,760m. The view is stunning. The day will start with a long climb of 3 to 3.5 hours to reach Nyile La (“the sleepy pass” at 4890m). From Nyile La, the mountain Takaphu (6526m) dominates the view towards the north. Tiger mountain is the main mountain to be seen looking east. Less than 30 minutes down is a sheltered area, our lunch spot. While passing a narrow gorge with a small river crossing, you can spot Masa Gang peak in the distance. When the trail gets flat and easy, Lingshi Dzong can be seen in the middle of enormous wilderness. Exploring from Lingshi to the east side is Takaphu (6526m). At the end of this valley is a small monastery called Gyo Gompa with a dramatic view over Jitchu Drake in the background. Below the dzong is the small village of Lingzhi which has a boarding school and a BHU. The population of this village is 300-400. Lingshi has a nine-month winter and a brief summer. Today will be a relatively long day so we will start early. We will take a trail through a beautiful rhododendron forest on the ridge above the camp and eventually enter a valley with few trees. We will then cross the main river to its right side and climb through an area called Jimenameshing. Finally after 4-4.5 hr from our previous camp we will reach the big cairn on top of the Yale La Pass, with stunning views of the snowy mountains around Lingshi and the Basingthang Peaks to the south. Most people traveling between Lingshi and Thimphu use the Yale La, so the trail is well marked. The descent joins the Jaradinthang river, which eventually becomes the Thimphu river. At around 4150m is a chorten from where the trail takes an easterly direction following the river. The campsite is at Shodu (4080m), just after crossing a sandy slope. Today will be a pleasant day of hiking with not too many ups and downs. After passing a deserted military camp we will follow the trail to the river through a limestone valley. While crossing the bridge over the river, we will witness grand views of giant rock faces and waterfalls. Towards the end of the day’s walk, the trail gradually ascends to the ruins of the Barshong Dzong at 3720m below which we will set camp. The nearby Barshong village is very small, numbering less than half dozen houses. In 2001, Jigme Dorji National Park (JNDP) staff spotted a tiger and a snow leopard moving just north of village. Today’s walking will be quite easy with no altitude gain, only descent to the Thimphu river. After crossing a side stream, the Tshongjug Chhu river, we’ll make a steep descent on a rocky trail ending at the Thimphu Chhu river. Reaching a split in the trail, the one on the right will take us to our campsite for the night, Dolamkencho. We will start today’s walk by climbing back from the campsite up to the main trail to a cairn at 3450m, from where the route will descend to a side stream. The trail then descends through thick bamboo forests, eventually reaching our final stop, Dodena. A large sign marks one of the entry/exit points of the JDNP, and a beautiful Bhutanese-style covered wooden bridge marks the path to Cheri Monastery overlooking the valley. End of the trek. Night halt at Thimphu. Drive to airport and departure. On this long day, the trail continues with lots of small ups and downs. After going uphill through the river valley the valley finally narrows gradually to a mere path which descends to a meadow where a camp will be set up. If you did not see Mt. Jomolhari the previous evening, you will still have a chance to get a great view early this morning. This morning the trek continues up the Paro Chhu valley which widens into patches of alpine meadow. The trail climbs 100m over a ridge to drop to another stream then. After crossing the Takhung La pass (4,520 m/14,829 ft) you decent to Thombu Shong, three yak herder huts with your campsite next to them. Day 8 / THOMBU SHONG TO GUNITSAWA VILLAGE (2,850 m/9,350 ft): 13 km/4-5 hours. Drive to Thimphu/Paro. Crossing Thombu La pass (4,380 m/14,370 ft) you will finally reach Gunitsawa where you can be collected or you may decide to stay at the campsite, Sharna Zampa, where you stayed the first night of this trek. End of trek. Camping & Trekking equipments including tents, carry mat, dining tent, toilet tent, hot water bottles (when needed). Trekking equipment (if required) - snow boots, gaiter, crampons, ice axe, etc. Accommodation in Paro/Thimphu. Could be arranged on request.